Summary: Shy took the summer job to make some money. In a few months on a luxury cruise liner, he’ll rake in the tips and be able to help his mom and sister out with the bills. And how bad can it be? Bikinis, free food, maybe even a girl or two—every cruise has different passengers, after all. 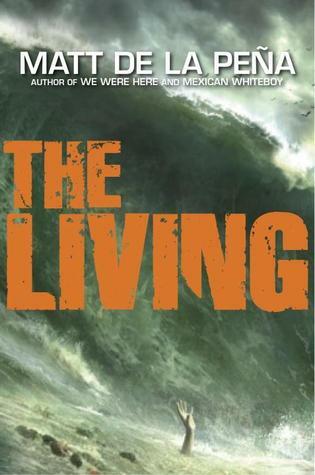 Review: On the surface, The Living appears to be a typical survival story with the possibility of a romance, but there are intriguing layers to this story that the reader can catch glimpses of along the way. Matt de la Peña is an excellent storyteller, but aside from the action and suspence, he is also tackling both race and class issues. Yes, there is an earthquake and shark infested waters, but those aren’t the only things Shy will need to navigate. A summer job on a cruise ship sounds glamorous, but for Shy it’s like any other summer job. Shy is a Mexican American from a working class single parent home. He is trying to earn enough money to help out his mom and grandma and have a little left over for himself. He has fun with his co-workers and has fairly light responsibilities. Occasionally he must deal with obnoxious wealthy people, but it’s not a hard job. Life gets complicated very quickly though. On his first cruise out, Shy witnesses something that inspires nightmares and brings a man in black to follow him around. This mystery takes second place though when a huge earthquake and the subsequent chain reaction of disasters hit. Shy is in a fight for his life and for those around him. The man against nature portion of this book is excellent and Matt de la Peña really created a believable character in Shy. He is a good kid and tries to follow the disaster procedures for his job, but he is in over his head in more ways than one. I felt like I was right there witnessing the disaster first-hand through his eyes feeling all of his fear and frustration. Beyond the fight with nature, there are dangers among the people around him too. It’s difficult to discuss without revealing too much, but this book deals with race, class, and ethics on a scale that I was not anticipating. Matt de la Peña discussed a little bit about this in his interview with NPR. Recommendation: Buy it now. This is a fantastic read for entertainment purposes, but it also provides a lot to think about. I am very eager to see what de la Peña has in store for us in the sequel.